World Sees 'Imperialism' in American Reach, Strength America's status as the world's sole superpower elicits complicated reactions internationally. Increasingly, those abroad who admire -- and even adopt -- aspects of U.S. culture are also quick to denounce the U.S. government as "imperialist." Every political generation spawns a new set of terms — ideas, words, rhetoric to help explain, simplify, advance or destroy a cause. This is the fourth report in a five-part series exploring the political language of our times. Series Overview: Read an essay on the impetus behind these stories. Read Part 1: "The War on the Word 'Jihad'"
Read Part 2: "Why 'Islamofascism' May Create New U.S. 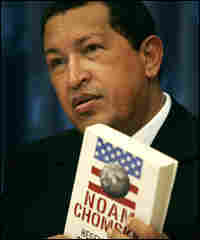 Enemies"
Read Part 3: "Defining the War on Terror"
A few weeks ago, Venezuelan President Hugo Chavez spoke at the United Nations. He used the word "imperialist" about every 45 seconds during the speech, always in reference to the United States. Around the same time, Hezbollah spiritual leader Sheik Muhammad Husayn Fadlallah told a crowd in Beirut, Lebanon, that "the real danger to the entire world comes from the imperialistic American power." But former House Speaker Newt Gingrich says that America is a different type of empire. "We have no interest in conquering territories," he says. "We have every interest in getting people to believe in their freedom and getting people to govern themselves. And those are inherently threatening." Every American president since Franklin Roosevelt has insisted that America opposes imperialism. But social critic Noam Chomsky argues that a strict imperialist doctrine was built into America's founding. "America was founded as an empire of liberty which the U.S. would spread over the Western hemisphere and look beyond that at the time," he says. As Harvard historian Niall Ferguson notes, the word imperialism is "tainted" with a negative connotation. Yale researcher Immanuel Wallerstein defines imperialism as "the effort of a strong power to impose its will -- whether it's an economic will or a political will or a military will or even a cultural will -- on the people of a country which is weaker." Over the past five years, Wallerstein has noticed that the term "American imperialism" has been making a comeback. "You go around Latin America, East Asia, black Africa, and they'll tell you the same thing," he says. "In fact, they'll tell you the same thing in most parts of the world," he says. Why the upsurge now? Johns Hopkins professor Francis Fukuyama says as long as the U.S. remains a dominant military, economic and cultural power, others will see America in a negative way. And he says the United States' military interventions in Iraq and Afghanistan have reinforced its imperialist image among critics. "I think it's almost inevitable that the lack of reciprocity in the influence -- that the influence the U.S. exercises versus what other countries can exercise back at us -- is just going to lead to a lot of resentment," Fukuyama says. "Resentment is tied to specific things like not finding WMD in Iraq, messing up the occupation [and] creating a lot of havoc unnecessarily." Ferguson agrees with Fukuyama's assessment, in large part because America denies its imperial destiny. "And if you do things when you're in denial," Ferguson says, "by and large, you don't do them very well." Six years ago, the Pew Center started asking people abroad what they thought of America. More than 50 percent of people in most countries surveyed resent American power, and the numbers continue to rise. Yet, the State Department says the number of people seeking visas to the United States increases annually. American businesses continue to franchise overseas. "That's why we're so insidious," says Cal State classics professor Victor Davis Hanson. "We appeal to certain appetites, freedom, leisure, affluence -- informality especially -- and that tends to drown out all these other, competing systems, and we know it does." But Hanson notes that the aspects of American culture that make it appealing to foreigners can also make existing hierarchies abroad feel threatened. "The freewheeling American approach to money, to education, to popular culture, means that the power of the mullah or patriarch or hierarchy in general is always undermined by radical American egalitarianism," he says. Ferguson notes that America is hardly the first world power to elicit such complicated and seemingly contradictory reactions from people abroad. "Clearly not everything about the Roman Empire was bad," he says. "There's a wonderful sequence in Monty Python's Life of Brian, when the question is asked, 'What have the Romans ever done for you?'" It's a question Ferguson asks about America as well. "What would the world have been like after 1945 if the United States had said 'Look here, it would be terribly imperialistic of us to occupy Western Germany and Japan for any length of time,'" he says. "I think a world without the United States after 1945 would have been a worse world."